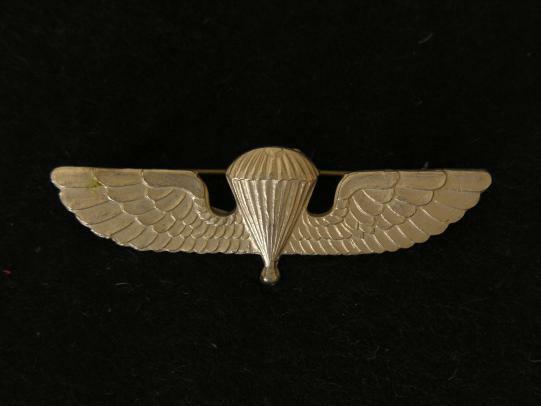 A good example of the USMC Para jump wings, pin back. Not maker marked. 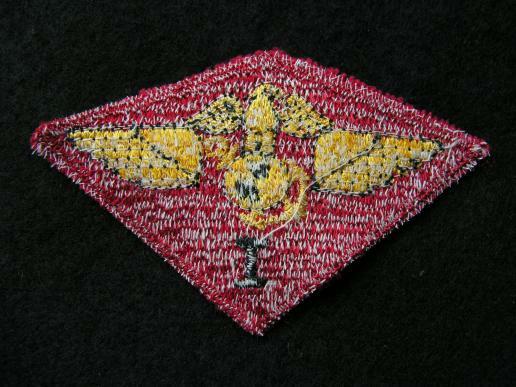 Measures 2 13/16" x 1"
USMC Fighter Attack Squadron patch. A Marine Corps Occupational Service Medal in good condition, full size. 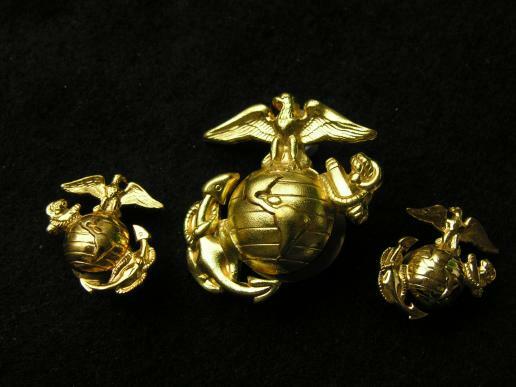 The Marine Corps Occupation Service Medal is a military award of the United States which was "Awarded to commemorate the services of Navy, Marine Corps and Coast Guard personnel in the occupation of certain territories of the enemies of the U.S. during World War II"
1. 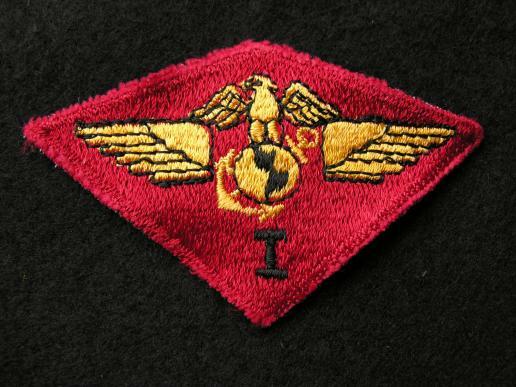 Pair of Summer Issue Sgt Major of Marine Corps sleeve Rank. 2. 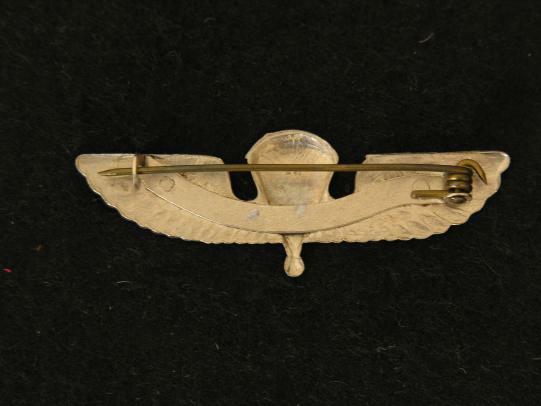 Pair of subdued collar rank insignia clutch back fittings. 3. U.S.M.C. cap and collar insignia screw backs. 4. Rifle Expert badge in metal with 2nd award bar clutch back fitting. 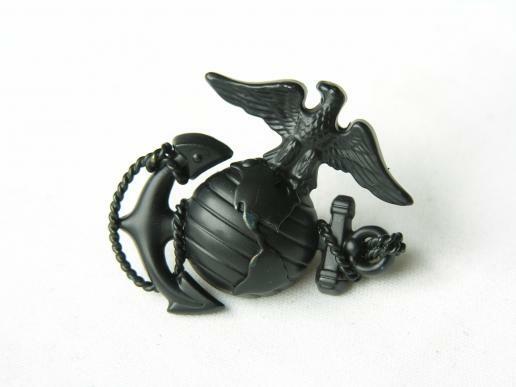 A good enlisted USMC cap and collar insignia set in black, screw back fittings. A U.S.M.C. 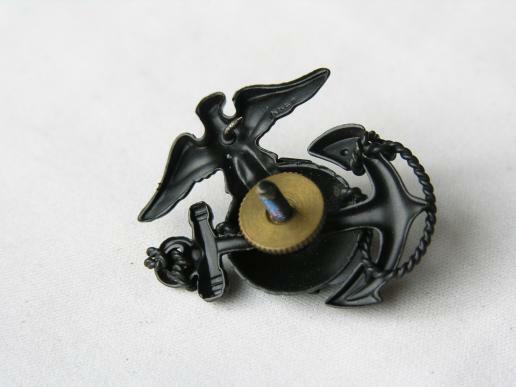 Officer's Marine Corps Service Dress cap badge. 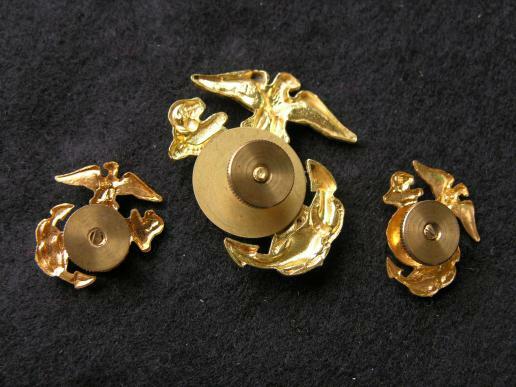 A good set of Marine dress insignia, all screw back fittings. This is one from Harry S Wosk shop in San Diego with the original sales label at 1 Dollar 50 cents (no that's not today's price) Bullion stripes sewn onto red wool. In mint condition. Measures 3 5/8" x 4 3/4"
Good original early set of dress Staff Sergeant rank , Bullion stripes attached separately to red wool. Here is an Australian made variation for the 1st Air Wing USMC. The 1st Marine Aircraft Wing is an aviation unit of the United States Marine Corps that serves as the Aviation Combat Element of the III Marine Expeditionary Force. The wing is headquartered at Camp Foster on the island of Okinawa, Japan. Activated in 1940, the wing has seen heavy combat operations during World War II, the Korean War and the Vietnam War.